Photos don't belong cooped up in your email's inbox, they belong on the web where you can share them with family, friends, or the world. As part of last week's major update, Picasa Web Albums now supports the ability to upload photos to your web albums using email. Here's how it works: If you'd like to enable email uploads, you're asked to personalize your '@picasaweb.com' email address by providing a secret word that is private to you. Once you save your settings, you will be able to upload images directly to Picasa Web Albums by attaching them to an email and sending the email to your picasaweb email address. So what's this good for? Lots! For starters, if you have a cameraphone that lets you mail pictures directly from your phone (like an iPhone), you can now shoot and post pictures in real-time. It's kind of like sending instant postcards from wherever you visit – no computer needed. And how about all those pictures of you that are sitting in your email Inbox, sent by family and friends? Simply forward those emails to your Picasa Web Albums email address and start organizing and sharing them. Speaking of friends and family, while we give you a private, customizable email address to use for your email uploads, you may well find that sharing your email upload address with a few trusted contacts allows for interesting collaborations. 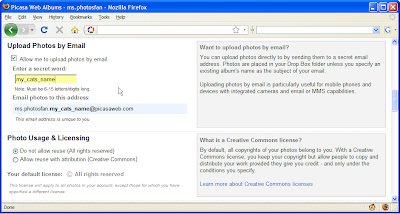 For example, email can be a painless way to get your extended family to upload snapshots to a central group album – whether or not they have their own Picasa Web Albums accounts. To get started, visit the Settings page in Picasa Web Albums and look for the new 'Upload Photos by Email' section. Then, set up your personal '@picasaweb.com' email address for image uploads, which will be a combination of your username and a secret word that you can change at any time. After that, when you email pictures to that address, the image attachments will automatically be placed in your drop box, or whatever album you specify in the subject line. All other email content sent to this address is ignored and discarded. We also won't resize or downscale any pictures you send, although there's a limit of 20 megabytes per email. We hope you'll have fun and get creative with the way you upload photos.